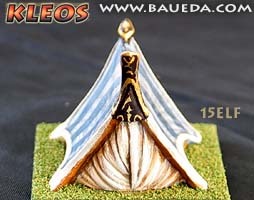 15mm Fantasy Tents AVAILABLE NOW! 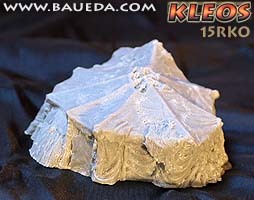 In the beginning, Ilúvatar created the Ainur. Mysteries untold lie within the civilizations of Arda. 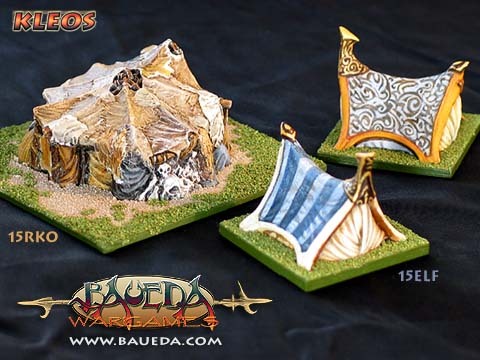 Meet these fantastic people's dwellings in this section, which want to provide housing for all the races that add flavor and variety to these fascinating worlds! 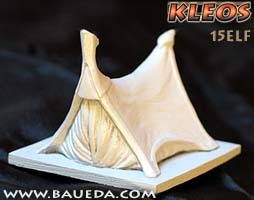 Like the rest of the Kleos range these models are designed to fit on a standard 40x40mm DBM baggage base or multiples of, and can be used as baggage for a DBx fantasy army, but are also perfect for scenario games, for dioramas or simply to improve the visual appeal of your gaming table. 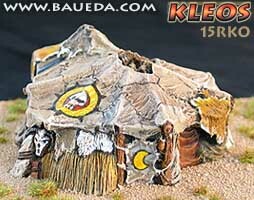 For the delight of Warmaster players this serie is designed to be compatible also with 12mm figures! 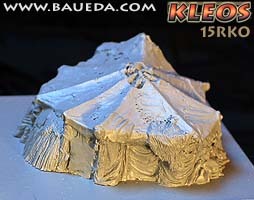 15RKO is available in three finish: simple plain cast, as it comes out of the mold; cleaned and primed, based and ready to paint; or as a finished DBM baggage element, painted, based and flocked to the very same standard you see in the pictures! 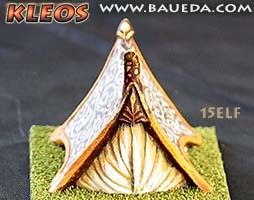 No Elven army would ever leave home without their tents; these are much more than simple shelters, they are in fact very efficent portable houses, and are considered as essentials to protect their owner from the elements as armour is in battle. 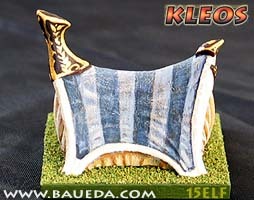 The external cover is made of strong fabric, usually decorated with the House colors, edged with embossed and gilded leather reinforcements and stretched over a light but extremely strong steam-bent wooden frame. Under this a delicate weave keeps it warm in winter and fresh in summer, as well as cutting out draught and humidity. 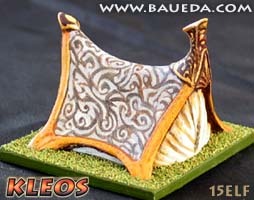 When forced to leave his encampment unguarded an Elf would cover his tent with nets and foliage to protect it from unfriendly eyes; it is said that the heroes of the past even had tents threaded with mithril runes that makes them invisible. 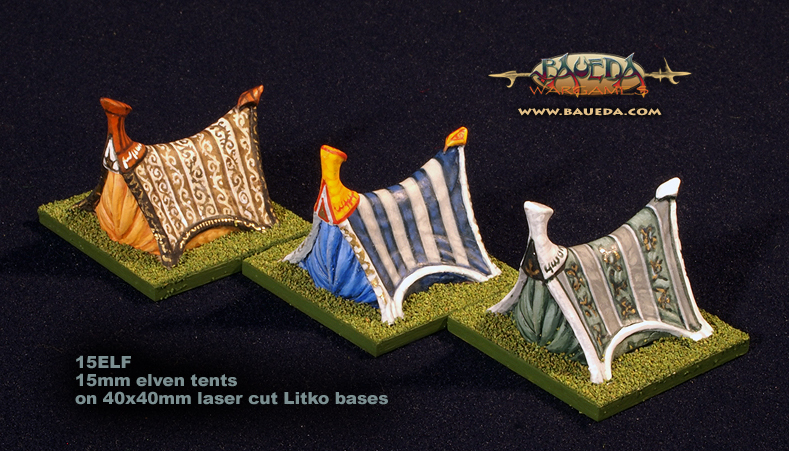 For sure still now is not easy for anyone to find an Elven camp! 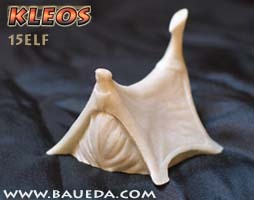 The model is about 32mm wide, 40mm deep and 32mm tall. 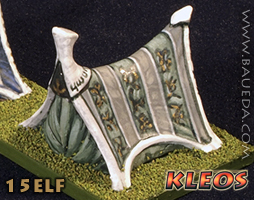 15ELF is available in three finish: simple plain cast, as it comes out of the mold; cleaned and primed, based and ready to paint; or as a finished DBM baggage element, painted, based and flocked to the very same standard you see in the pictures!